We all have people we care about in our lives, and when they are in trouble, or just seem to be, it can be hard to figure out what to do. Intervene. Give them their space and hope for the best. Simply let them know we are there for them. Or utilize some combination of all of the above. Sara Anderson is a widow, who’s been through a pretty rough year. But she has good stuff happening in her life, too. She has a six month old son, Charley, whom she adores. And volunteer work as a veterinarian providing medical care for service dogs. Matt McCabe is an ex-soldier and current Laramie County rancher, who is spending more and more time alone. Sara needs his help, temporarily caring for Champ, a puppy in service dog training. When he refuses her, she begins to worry. This isn’t the Matt she knew in high school, who was fun-loving and gallant to the core. The Matt she had always secretly lusted after, but never dared to pursue. Matt thinks Sara has changed, too. She’s got a wall up around her heart that leads him to believe the rumors about trouble in her marriage, before her husband’s death, are true. He wants to help her, as much as she wants to help him, yet neither are willing to divulge their own secrets. And without honesty and trust, while there can be passion, there can be no real, long-lasting, heartfelt love. Will Matt and Sara find their happily ever after? There’s only one way to find out! Read an EXCERPT of His Baby Bargain and check out the other books in the TEXAS LEGENDS: THE MCCABES series. 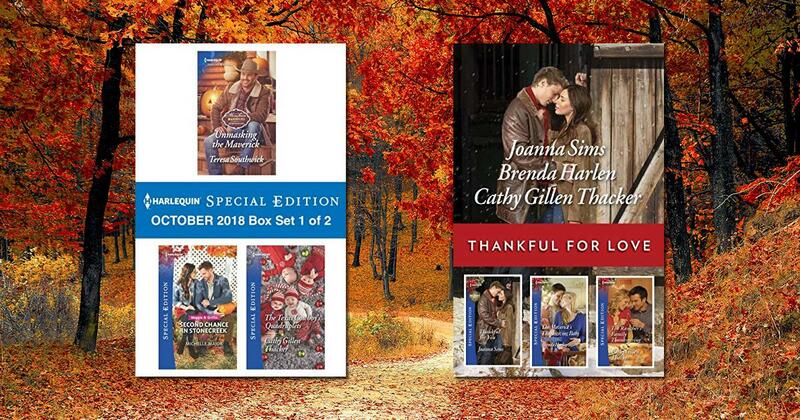 Grab these two great bundles from Harlequin authors to get cozy with this fall season. The October box set includes my newest book, THE TEXAS COWBOY'S QUADRUPLETS, as well as stories from Teresa Southwick and Michelle Major. And the Thankful for Love bundle includes THE RANCHER'S FAMILY THANKSGIVING from my TEXAS LEGACIES: THE CARRIGANS series as well as stories from Joanna Sims, and Brenda Harlen.